A couple days ago Matt and I decided to go shoot some arrows. I know its way random, but I just read a book about this girl who was in a stadium and shot through an apple in a pig's mouth that was in the bleachers, so that could be the real reason. It is also possible that I really have secret Robin Hood like skills that I needed to discover. This wasn't the case, but it was really fun, and I appreciate people who can actually aim with a bow now cause by the end of the hour I could barley pull the string back. If you were wondering...Matt was automatically a pro and was even giving me pointers. Here are some pics of the day. They give you new targets without any holes when you start off. You can go ahead and guess which target is mine. Notice on the one below how many more holes are in it than the one even lower. I might have had a hard time hitting the actual target. If Matt had more time with this I don't think it would take long for huge chunks to be taken out of the paper because he hit it so many times. At least I touched the white in the middle a couple times. Just to get an idea of how far we were from our targets. Matt of course was automatically good at it. Really what else is new if he wanted to I bet he could live in the wilderness with a bow and arrow and hunt his own food, and survive easily. He hit the X on the bulls eye. Pretty impressive. So I have had these pictures for so long, but I thought TL would want to see them seeing as how they are her kids. For Scott and Jill's birthday treat I took their kids for a night while they went out and played. We had a lot of fun playing outside, making bread, and a little mario kart. Here are some pics. Playing some MK it was a little tough at first but they started to get the hang of it. Playing in the gym with the music blaring of course. Presley being a little hesitant about looking at the camera. There we go just had to get her warmed up. Ok maybe a lot Landon would just squeeze the dough really haha but they all turned out good! The football season has started. Yes its only preseason right now, but it is finally time for the weekly viewing of the Redskins. Its actually something that I have been looking forward to. I like to watch the games every week now that I know the players (thanks to Matt's shared knowledge over the past year). We are going to a game in December in San Fran so I think that makes me a legit fan. So if you don't like the new backround... tough embrace it cause its going to be a long season haha jk...but for real. Here is a brief look at some of our favorites, cause I know that you all are dying to know this, so I will save a phone call for you and just tell you about our favorite players. 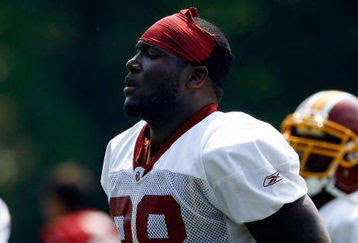 This is Brian Orakpo. He was drafted this year to the skins from Texas. Matt calls him a "man child" if you heard his voice you would understand why. This guy is one of our new favorites out of the rookies he is a beast. This is my ultimate favorite. 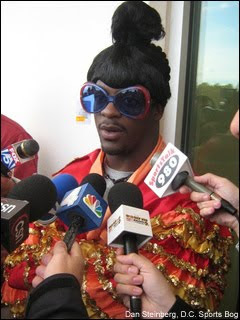 Clinton Portis "CP" and by this picture I hope you get a little perspective on his personality.He is hilarious thats one of the reasons why I like him so much. He is the starting RB, and I'm pretty sure he will lead the league in Running yards this year. He dresses up as different characters sometimes, so this is one of many. Although Matt has a bunch of favorites on the team I think that its safe to say LaRon Landry is his favorite player. He might kill someone with how hard he hits. You guys are probably thinking you are crazy Ashley, but its seriously fun. Everyone who has a husband who is obsessed with sports will understand at least. Little Ari....she is so cute and such a good little girl. We had the chance to fly down to Las Vegas this past weekend and stay with Matt's brother, and his family. It was so much fun just to hang out with them because we never get to see them. Plus we got to see their new baby boy, Jack. He is soo cute. Saturday we did some shopping at some of the outlets, and then afterwards Mitch and Sarah took us to this sushi restaurant, and I was a little bit of a doubting Thomas, but it was seriously so good. They had this Bonsai sauce it was so good I would even dip popcorn in it. Every time I go to Vegas I will make a stop there for sure. Sunday we went to church with them, and I got to go to YW and listen to Sarah give the lesson she did such a good job, and the girls love here obviously cause she is so cool! We took a nap and went walking around the Las Vegas temple, the weather was so nice. We ate dinner and then drove out to their new house that they will be moving into in a couple of weeks. It is so cool, its pretty much brand new, and its in such a cool area. We were sad to go, but Monday we met up with Mitch for lunch, and headed to the airport. Our airplane was delayed but thats alright. Matt and I just hung out for 4 1/2 hours in an airport...its so much fun you should all be jealous. Anyways we had the best weekend. It was so nice for Mitch and Sarah to let us stay with them and feed us...you guys are awesome! Another one of Ari at the temple. Matt and I at the Las Vegas temple. Notice Ari in the left corner trying to touch the water. Mitch, Sarah, Ari and little Jack...coolest little family. Matt and Ari walking up the hill to look at the view. Mitch and Sarah's new house! So cool looking I love the look of the Vegas houses.